The Covarrubias adobe, at 715 Santa Barbara Street, is one of the oldest buildings in the city. Unlike many of the historic adobes in Santa Barbara, the Covarrubias adobe is not named after its original owner. Domingo Antonio Ignacio Carrillo had the home built in 1817 for his wife, Concepción Pico Carrillo. 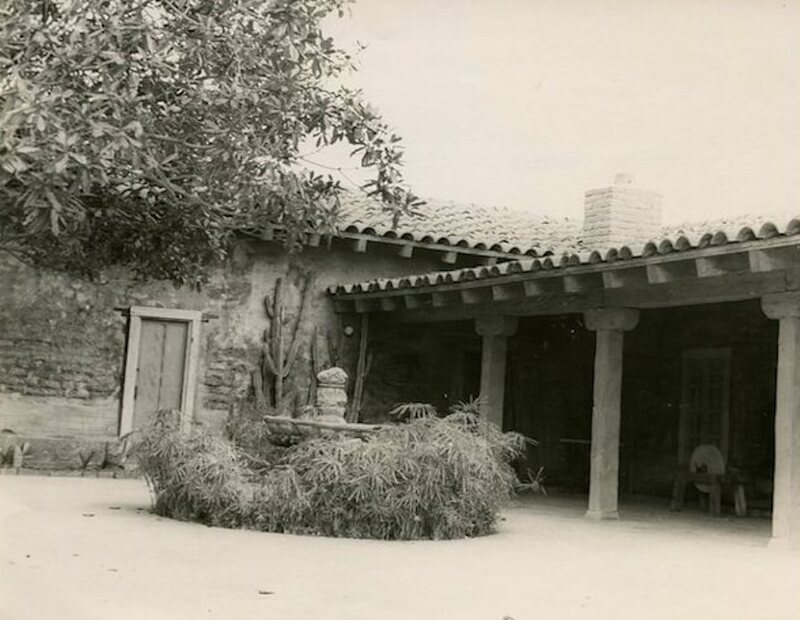 The adobe later became known as the Covarrubias adobe after José María Covarrubias, who married into the Carrillo family. Domingo Carrillo enjoyed a distinguished military career, serving as comandante of the Santa Barbara presidio in the early 1830s. In 1810, he had married Concepción, sister of Pío Pico. Pico was in the governor’s chair when California came under U.S. military rule in 1846, making him the last Mexican governor of California. The L-shaped adobe contains four rooms, the largest of which is the 55-foot long sala. The original roof was tile, perhaps made at the Old Mission, and was supported by an underpinning of willow canes and mud. Carrillo died in 1837 and his wife continued to live in the adobe until her death. In 1838, one of her daughters, María, married José María Covarrubias. A native of France, Covarrubias had settled in California 1834. After his marriage he drew upon his new family ties with Pío Pico, becoming his private secretary in 1845. He smoothly made the transition from Mexican to American rule and served as a delegate to the state constitutional convention, sat on the state legislature, and became a Santa Barbara County judge. Sometime in the 1850s, ownership of the house was transferred to the Covarrubias family. Members of the family occupied the house until about 1910, after which it stood vacant for a few years and then was occupied by a number of different tenants. In 1920, John Southworth purchased the property. Southworth had written a number of regional histories including works on Los Angeles, San Diego, Baja California, and areas in Mexico. He later wrote a series of short works on the history of the Santa Barbara area and its historic adobes. By 1920, the Covarrubias adobe was in poor repair and Southworth constructed a concrete wall around and underneath the adobe walls to protect them. Southworth also purchased the “Historic” adobe and moved it from its location just south of the Recreation Center to its present location near the Covarrubias adobe. He opened an antique shop in the Historic adobe. In 1936, he put both adobes up for sale, but as there were no immediate takers, he leased the properties. For a short time, the Covarrubias adobe became a restaurant and nightclub. Los Adobes de los Rancheros, a non-profit corporation affiliated with Los Rancheros Visitadores, the fraternal men’s riding group, purchased both adobes for $15,000 in 1938. In 1940, the Rancheros undertook a massive reconstruction of the building, including buttressing the west and south walls. Joseph Plunkett, designer of the Arlington Theatre, and Charles Urton, builder of the Granada Building, supervised the work. The adobe became home for a shifting variety of businesses and groups. It was home to the British War Relief Society during World War II. It was also home at one time or another to the Chamber of Commerce, Old Spanish Days, and the office of the Santa Barbara National Horse and Flower Show. The adobe was declared a California State Historical Landmark in 1959. It is a Santa Barbara City Landmark and is on the National Register of Historic Places. In 1964, the Santa Barbara Historical Society bought both the Covarrubias and Historic adobes. Today a portion of the former serves as the office of the Society’s Docent Council. The adobe is also the site for weddings, Fiesta events, and other community activities.